While I am in no way qualified or equipped to keep up with the comings and goings of Rock Band DLC, I think it should be present on the site. Fortunately, Harmonix maintains their own forum posts with DLC re-licensing updates and loads of threads on highly specific track availability. If you’ve come to the site looking for Rock Band track info, please check one of the links above, dive into Harmonix’s official Rock Band forums or try rbdb, an unofficial but exhaustive database of track info for all the games in the franchise. “Harmonix aimed to provide a wide range of music to players through additional content, stating that Rock Band is a music platform for discovering music. The developer released new songs, compatible with both games, through regular weekly DLC, including various singles, artist packs featuring three or more songs from the artists, and full albums. Downloadable songs are compatible with Rock Band and Rock Band 2. 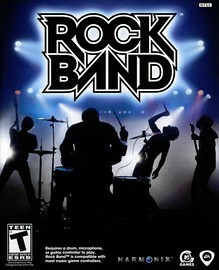 Downloadable content released on or after October 26, 2010 is restricted for use with Rock Band 3, Rock Band Blitz, and Rock Band 4 while content released on or after October 6, 2015 is restricted for use with Rock Band 4 only. By the release of Rock Band 3, there were over 2,000 songs from over 250 different artists available for the Rock Band series through on-disc songs, imported track packs, the Rock Band Network and downloadable content, including 21 complete albums.